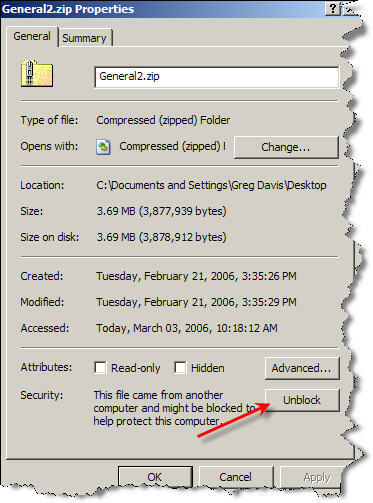 You may stumble across situations where you have downloaded a compressed folder (ZIP file) from the internet, but cannot open it with Windows XP (SP2). There is a security “feature” built into Windows to protect you from malicious programs that are created on another computer but running on yours. For example, when you go to open the ZIP file by double-clicking on it, it will appear empty and if you try to extract the files that are in it you will get the message that they are being blocked or the extracted folder also appears empty. If this happens you should first try to unblock the file, by right-clicking on it, then selecting properties. You will then get a window that has an “Unblock” button near the bottom like this. This still may not work in some cases however. If the web site you are getting the file from has created the zipped file and used the complete file name and directory of the source file this will be a problem. For example, if the source file was named “File 1.txt”, but was stored in a directory like “c:/My Documents/New/Sample/” this information would be kept in the zip as well and would created problems for Windows XP because that directory is not on your local PC and Windows is protecting you from allowing it to be created. See this article. (It is 2 pages, just click to page 2 when you get to the bottom). If this happens, the web site or provider should be notified so they can change the way they are creating the zipped files to not include the complete file directory information. As a workaround, however, you can use a product like WinZip to open the folder and actually get to the files. Hopefully, Microsoft will provide a fix or workaround for this as well, but you never know. In the mean time work with the creator of the file and try WinZip (or StuffIt) as an alternative.